As a professional who has worked in the event/wedding industry for over 18 years I can say Tasa & Rob know how to entertain. Their musical library seems endless, all the songs you want to hear and the ones you forgot you love are part of their catalogue. Their unique style and presentation of music brings to life any crowd in any forum. They are true musicians with the passion for entertaining and should not be missed. They understand the word professionalism; they arrive early, look great, stay late, and make sure everyone has a great time. One good listen and you'll be hooked. I highly recommend Tasa & Rob for any social gathering that music is required. I have had the extreme pleasure of working with Tasa + Rob on several weddings and special events over the years and they are truly the best! From their professional level of customer service, to their attention to detail - not to mention the talent and energy they bring to your event! I urge you to consider them for your next special event - you won’t be disappointed! ​The sounds of Tasa + Rob are nothing short of amazing! This duet has masterfully figured out how to pair the classic sounds of rock with new sounds of pop & country. We had heard Tasa + Rob several times at their gigs out in Boston. It was upon the first time that I heard their harmonious sounds, that I decided they had to be an integral part of our up-coming wedding. Wanting a non-traditional wedding, my husband and I met with the duet to plan the perfect entrance into marriage via their sounds. I walked down the aisle to the a mixture of the sounds of the ocean and that of Tasa's voice singing "Make you Feel My Love." Tasa + Rob were the perfect entertainment for our Cocktail Hour and were able to capture the mood, attention and the rhythm of the space. I am always amazed with talented people and have been captivated by the sounds of Tasa+Rob. I have highly suggested them to friends that have gotten married and also public events around the Boston/NY area. I continue to look for events that I could possibly have the benefit of their sounds around me! Amazing performers! Dave and I were so happy and grateful to have Tasa + Rob perform at our wedding reception on October 8, 2016. It was fantastic!! Perfect! It was wonderful that they allowed us to choose a few of our favorite songs to learn. Everything they did was GREAT! Our friends and family really loved their performance as well. We would love to someday ask Tasa + Rob to perform at another event. We hired Tasa + Rob for our outdoor dinner party. We had heard them play previously and were very impressed. They were perfect for our party and couldn't be nicer or more professional. They struck the perfect balance. Our guests could hear the music, while also enjoying speaking with each other. Tasa + Rob added so much to the party; everyone just loved them! They have such an incredible range of songs...songs you haven't heard in a while, as well as current songs. They played each song with their own style too, which was refreshing to hear. Now, many of their versions are the only ones I like to hear! As each guest left the party, they thanked us for a great time and requested that it become an annual event...if Tasa + Rob would come play for us! We highly recommend them. Tasa + Rob will make any gathering special. We enjoyed Tasa + Rob's beautiful contribution to our celebration event. They have a wonderful style and an absolutely lovely blending of voices. They really have a wonderful virtuosity on their instruments together. The two of them really made our evening all that we had hoped for. We are so glad we found them!! We first heard Tasa + Rob play at a local gig in Siesta Key, FL. Their special chemistry, ability to keep the audience engaged, and of course how wonderful they sounded, immediately captured our attention. Throughout the evening, we enjoyed hearing songs from many genres which were all beautifully performed with their own unique touch. As we were leaving for the evening, we both agreed Tasa + Rob would be perfect for our wedding!They performed our ceremony, cocktail hour, and our first dance. The elegance of Tasa’s electric violin combined with Rob’s acoustic guitar rhythm made the acoustics in our ceremony truly beautiful. When we mentioned our first dance song, Tenerife Sea, they even said they had learned it recently and played us a sneak peek months before the wedding. It was beautiful with the violin as a romantic first dance with a personal touch. We were so happy to have such a wonderful and talented couple be a part of our special day! Tasa + Rob are exceptional musicians and even better people. We can’t wait to get back to Florida to hear them play again! We're Tasa + Rob's new friends from Canada! My wife and I winter in Sarasota each year and only discovered them last night, at Walt's Tiki Bar. Sadly, it's time to head north to home, for the summer. However, before leaving, we decided on a night out with my brother, at a new venue (Walt's). We left Walt's last night, thinking we'd hit the jackpot! The meal and drinks were good but, the highlight of the evening, for us, was Tasa + Rob's performance. We really enjoyed the interaction with them both and their music & singing is fabulous. I've bookmarked their website and will look forward to enjoying many more evenings of their entertainment when we return in the fall. My sister and her husband have lived in Marshfield for the past 26 years to the month. They finally were able to buy their dream home on the ocean. To celebrate, they invited all of their friends and family to a cookout! As a housewarming gift, I decided to hire some entertainment… Tasa and Rob. I got their name as a reference from another entertainer, and they came highly recommended!! I couldn’t have gotten any luckier!! They came onto the porch, which over looked the ocean, and they looked & played the part of the beautiful ocean front venue. Tasa+Rob entertained every age group from 21 to 55. Everyone sang and danced along to their music. Tasa played the violin beautifully and Rob was on the guitar! ​Between their instruments and their vocal talent, I honestly thought they made the whole gathering complete! Not only were they terrific entertainers... they never stopped… & they never took a break!! They were absolutely amazing!! They played and played, and then when it was time for them to stop, we didn’t want them to leave so they stayed another hour!!! To this day everyone talks about that night! The text messaging and facebook comments were nonstop...! We are hoping to plan this summer’s party around Tasa and Rob’s trip back to the Boston area!!! It won’t be the same unless they are here entertaining us. What a blast!! We truly had so much fun, creating memories that will stay with us for a long time!!! 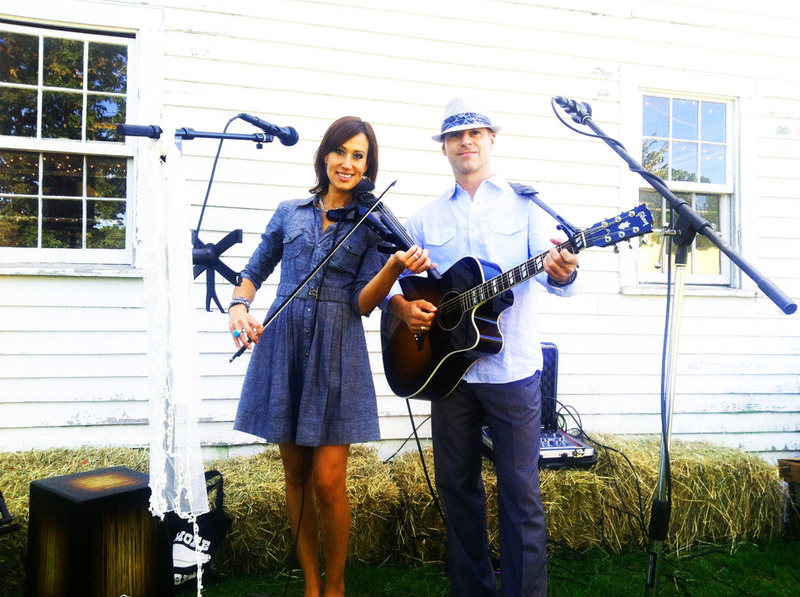 ​​​My wife and I had asked Tasa and Rob to play for our Cape Cod wedding reception in August 2010. Simply stated, they were spectacular. Their on-stage chemistry is magical and flawless. Tasa and Rob seamlessly intertwined so many varieties of songs and kept the atmosphere exactly how we wanted it; relaxed, casual and FUN. To celebrate our nuptials, we had asked them if they would be willing to learn “our” song. They came through and sang it so beautifully. In addition to our request, they took it upon themselves to learn two or three additional songs just because we loved that specific group. What true professionals! We would highly recommend hiring Tasa + Rob on any occasion for which music is called for. We try to get out and see them as often as possible. Every time we hear them play, they add something new to their repertoire and “knock it out of the park”! Thanks so much for the music at Cha Cha Coconuts on Friday night. We just loved you both... Great personalities and great talent. What a soothingly, refreshing sound. You guys did an awesome version of Wagon Wheel. How can we get a cd? Love the website too! What a dynamic duo! We love to come out to see you as often as we are in Sarasota. Your harmonies are so beautiful, and we love hearing the sound of the violin with the guitar... What a great combo!